The northern suburb of Lincolnwood recently filled in the final gap in the Valley Line Trail, a paved multiuse path that runs from the Sauganash neighborhood on Chicago’s Northwest Side to Skokie, creating an uninterrupted 4.5-mile corridor for transportation and recreation. The trail has been developed in segments along a former Union Pacific railroad spur. The mile-long stretch in Chicago, known as the Sauganash Trail, opened in the summer of 2008 between Bryn Mawr Avenue and Devon Avenue, the city’s northern border. The section of the Valley Line Trail in Skokie was built in two phases. The first phase was built from Dempster Street, next to a CTA Skokie Swift (Yellow Line) station to Oakton Street in downtown Skokie in conjunction with the opening of the ‘L’ stop in the spring of 2012. The second phase from Oakton Street to Lincolnwood border at Lincoln & Jarvis Avenues was completed in the summer of 2015. The Lincolnwood section, between Devon and Lincoln/Jarvis was built between July and October 2016 at a cost of about $1 million using federal Congestion Mitigation and Air Quality funding for 80 percent of the construction costs, with the village providing the required 20 percent local match. This stretch of the path runs adjacent to a ComEd right of way. The Valley Line Trail segments in Sauganash and Skokie previously served mainly a recreational facility for nearby residents due to their lack of continuity, and they were lesser known than the popular North Branch Trail, located to the west of the Valley Line. But the current extension transformed the Valley Line into a practical route for longer walks, runs, rides and commutes, which should help attract new users and spark interest in future extensions down the road. In September, a new southern extension of the North Branch Trail opened between Devon and Forest Glen Woods, and another new stretch is planned which will continue the trail south to Foster Avenue, by the LaBaugh Woods. If the Valley Line was extended south a bit more from Bryn Mawr, it would meet up with that newest stretch of the North Branch. 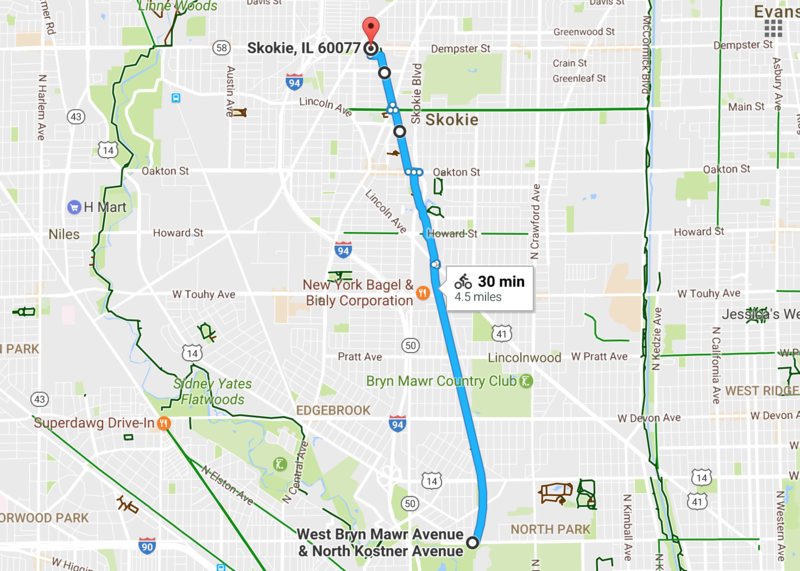 A more ambitious trail extension possibility would involve extending the Valley Line Trail several miles north from Skokie to meet up with the existing Skokie Valley Trail, which runs between Lake Cook Road, the county line, and Rockland Road (Illinois Route 176) in Lake Bluff. This would require each suburb along the way to build a section within their boundaries. In addition to the Valley Line Trail, another trail is being built in Lincolnwood nearby along the former Union Pacific Weber Spur. The Weber Spur Trail will run one mile between the city limits at Devon and Touhy Avenue by the Lincolnwood Town Center and the nearby North Shore Channel Trail. The project cost is $955,000, funded by federal Congestion Mitigation and Air Quality plus another local match from the village. Construction began in August and the trail is expected to open this spring. Hopefully the openeing of the Weber Spur Trail in Lincolnwood will motivate the City of Chicago to extend the path south from Devon to Bryn Mawr where it would meet up with the south end of the Sauganash Trail. This would be an ideal bicycle trail junction, and it could pave the way for a future connection with the North Branch Trail. Lincolnwood deserves a hat-tip for building these sections of the Valley Line Trail and the Weber Spur. Both of these projects should be catalysts that should help generate future development and trail extensions. Streetsblog Chicago will resume publication on Tuesday. Have a safe and fun New Year’s Eve. In the current situation, what would be a good route to go from the northern terminus at Dempster to the North Branch trail? Dempster Westbound looks pretty daunting where it crosses the Edens. Lincoln Avenue south of the current terminus looks like your best bet. You don’t want to ride on Dempster. From the terminus at Dempster, go back south to Main Street, which has a marked bike lane. Go east about 2 miles to the North Shore Channel Trail. Go west to Lincoln, then follow Lincoln when ends at Dempster, just a block or two east of the North Branch Trail. Overall a very nice trail, but the farther north you go the less clear the crossings are marked. On the way back I rode the extension of the North Branch trail . That is very nice too. No more double crossing Caldwell, which was always frustrating. And all major road crossing are signaled. If you look on the map you’ll see two houses built on the south side of Bryn Mawr already. I remember reading somewhere that the city tried to stop this in order to extend the Sauganash Trail, but were told in court they were too late for their application. North of Bryn Mawr I saw surveyors doing measurements. The city needs to lay claim to the property before Union Pacific sells it to private developers. In May of 2015 a public meeting was held to start the planning, but little if anything doesn’t seem to be getting done. The subject doesn’t come up with the city or from the 39th Ward. While the bike/walking trails are nice, a light rail line connecting Skokie all the way to the end of the Ravenswood L would be a useful addition. Church Street and Beckwith (West of the trail) are part of a bike corridor in that area. I believe if you go west from the NBT on Beckwith you can get to the DesPlaines Trail. Their are buses that connect from the current Ravenswood el to downtown Evanston and the Lincolnwood mall. The trails do have possible connections to the Skokie Swift in Skokie. If you bike with kids, there are lots of playgrounds nearby the trail. It also goes to Emily Oaks and the Exploratorium in Skokie which are great. It’s particularly the two lanes of traffic in each direction that makes these crossings scary. Sure, one car might stop for the flashing light, but can you count on the guy in the other lane to stop too? I do like the forced zig-zag in the middle of the road though (fences were recently added to make it even more forced), and otherwise the trail seems very well-designed (including the informative signs at the not-yet-existing Touhy bridge). Yes, we noticed as well that it was installed incorrectly. It’s on my list of to-dos to contact Ald. Laurino or Lincolnwood about the mistake. My understanding leaving that Weber Spur meeting in May of 2015 was that it would be at least a year or two before a design proposal was drawn up and showed off to people and longer still before shovels were in the dirt. I know that my alderman (45th ward) was adamant that it extend into our ward to Cicero and Wilson and the Project Manager seemed equally adamant that it would be expensive and time consuming and potentially not worthwhile (I disagree). Not sure if that is complicating things or if this is just how long we can expect these things to take, but I plan on asking my alderman about it next ward night. I agree, the sooner that trail gets built, the better. The quietest way to the North Branch Trail would be to take the Sauganash trail to the southern end at Bryn Mawr. Go west and follow the marked Bicycle route signs until you reach Cicero and Forest Glenn. Once on Forest Glenn, follow that until you reach the current start of the North Branch trail, which starts right at the river. In this route, you cross under the Edens, so it’s pretty safe. The new multiuse path runs along the old Union Pacific Weber Spur for one mile between the city limits at Devon Avenue to Touhy Avenue by the Lincolnwood Town Center. The North Shore Coordination Plan could be a mixed bag.